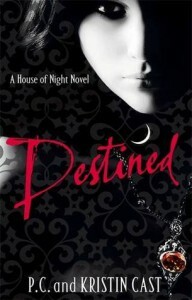 Destined (House of Night, #9) - P.C. and Kristin Cast - So many books, such little time. '"Tonight, 'seen with True Sight,'" Aphrodite quoted quietly. "Darkness does not always equate to evil. Light does not always bring good.'" "I told you we should have brought Kramisha," Stevie Rae whispered. So we left off with Zoey's mum being murdered by Neferet as a sacrifice to Darkness in exchange of a gift; a vessel that is Aurox. But due to Linda Heffer not being a perfect sacrifice for the task, Aurox is flawed. After finding out about her mother's death through a vision from Nyx of her greeting Linda into the Otherworld, it felt like she didn't care at all and throughout the story we never really see her breakdown or at least reflect on her mother. When Zoey returned from the Isle of Skye, Queen Sgiach gifted Zoey with a seer stone which 'is in tune with only the most ancient of magicks: the kind I protect on my isle. I am gifting you with it so that you might, indeed, recognise the Old Ones if any still exist in the outside world...' This stone she wears around her neck becomes hot whenever ancient magick is around and it only seems to happen when Aurox is near. We also revisit Heath in the Otherworld, which was a little bit of a surprise as I thought with him 'passing on' that would be the last of him, but no. We see him talking with Nyx, who has a proposition for him to go back to the real world but not as himself. A new character has been introduced. Shaylin was blind until she was marked with a red mark instead of the normal sapphire mark, and now she can see with True Sight which is being able to tell what colour 'aura' someone is but she must learn what the colours mean. I feel like she will be an important character in the next few books. So I will be keeping an eye out for her. Also, we dwell deeper into Lenobia's past. With Neferet hiring local humans to come help out some professors to build some form of relationship with the outside world, Travis Foster has to help Lenobia in the stables. From her reactions and emotions towards him we sense that in the past she has had a human mate or consort. But we will only really find out her past in her novella. Destined actually gripped my attention from start to finish, and the ending was amazing and I can't help but stop thinking that this would make a great movie; the special effects would look incredible. Although not many huge events happen and the narrative stays around the death of Linda Heffer, it's all about the journey to discovering the truth.